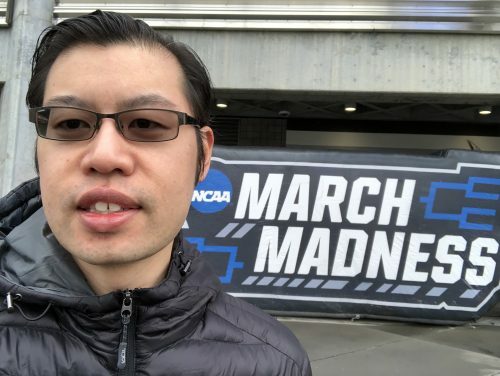 I had an incredible experience at the March Madness NCAA College Basketball tournament in San Jose. 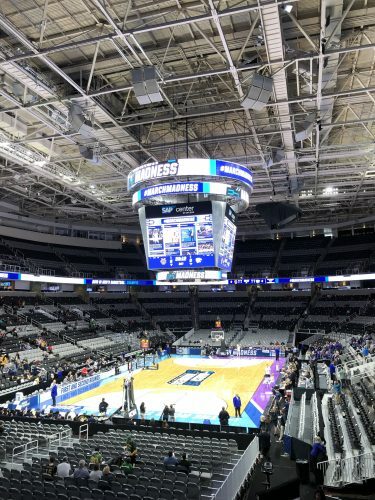 Its definitely a special moment and one to check off the bucket list to see a March Madness game. Its a college basketball tournament where the 68 top college teams compete for the championship. I have to admit that I don’t know a lot about college sports. Nevertheless it was exciting to attend and be a part of it. 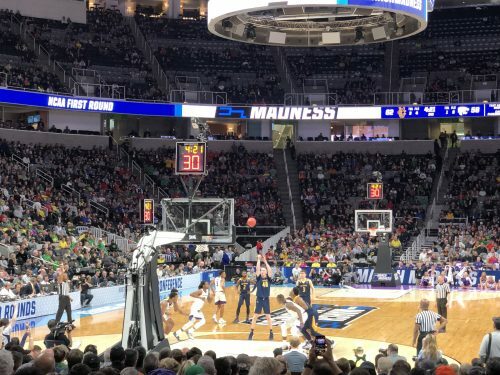 Having gone to college (or “uni”) in Australia, I don’t have the same connection to a college in the US or the connection to college sports as people from the U.S. College sports was never a huge thing in Australia. In the U.S its a big deal. 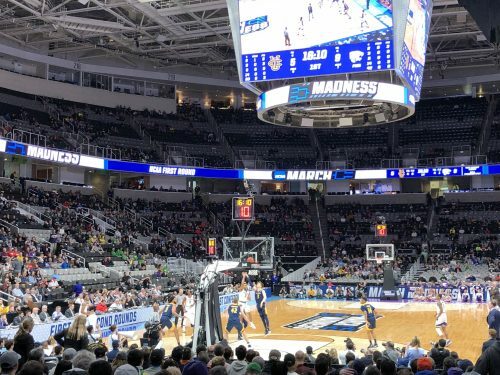 People travel from all around the country to attend these games and they passionately follow the colleges they graduated from. When I arrived at the SAP Centre, I could see the streets were blocked off near the stadium. 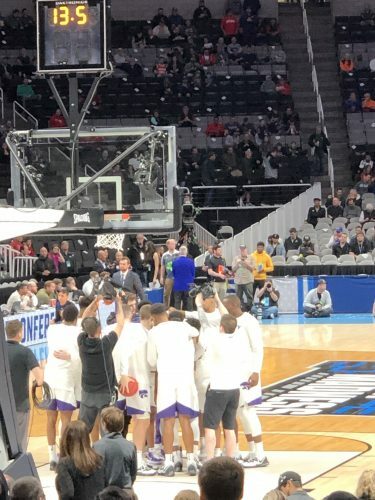 There was a sea of green for Oregon and the purple army from Kansas State. The reds also arrived to support Wisconson, and the local crowd decked in yellow and blue came to support UC Irvine. The crowds were chanting inside the stadium and getting rowdy when the game began. They also had dedicated seating for team supporters on opposite sides of the stadium. Blocks of green, red, purple and yellow. It was very cool! The games were exciting and entertaining. 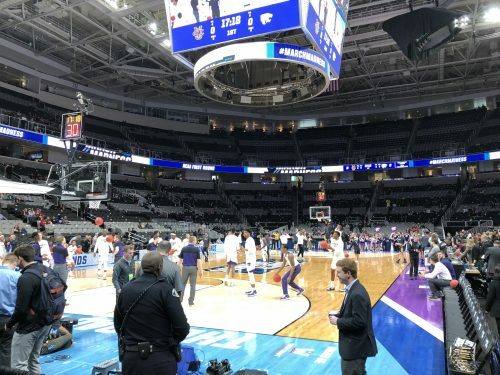 We witnessed a huge upset when UC Irvine beat Kansas State, one of the higher ranked teams that had progressed to Elite Eight last year (the final 8 teams). 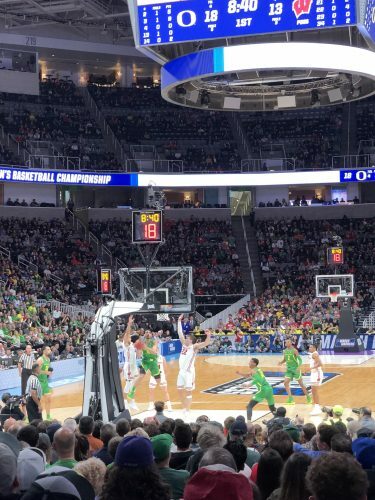 I also saw a superior Oregon ducks team take down Wisconsin. They were more athletic, longer and had a point guard who could create his own shot. Today was the first round and the second round is on Sunday. I’m looking forward to the rest of the tournament and the “road to Minneapolis” where the finals will be held!